Yes, I know you can't see a lighthouse in this photo - that's because there isn't one. I've included Tynemouth Castle here for historical reasons only. The monks of Tynemouth Priory are reputed to have maintained a light here as early as the 12th century. In 1664 a more formal arrangement came into being when the then governor of Tynemouth Castle, one Colonel Villiers, constructed a 79 foot tower using stone from the ruined priory. A coal fired light was installed on the top of the tower. This lighthouse underwent a partial rebuild in 1775 and finally, in 1802, a revolving oil lamp with copper reflectors was installed. This light suffered from problems mostly caused by air pollution resulting from the smokey exhausts of the many steamships entering and leaving the river and, in 1898 it was rendered obsolete when the light on St Mary's Island was brought into service. 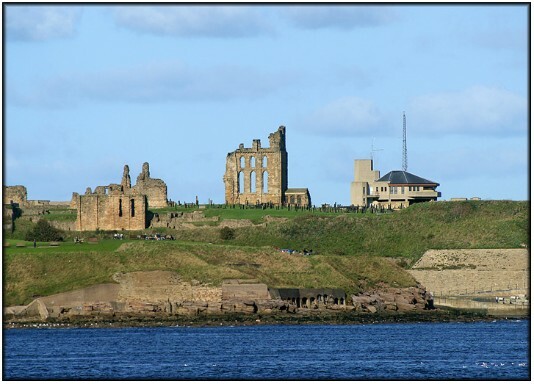 In this photo, the building on the extreme right with the tall lattice mast is the Tynemouth Coastguard station.